Ben Wheatley is fast becoming one of my favourite British directors and now that he is getting bigger budgets for his movies his movies will only become even better. Free Fire is undoubtedly on the list with one of his best and this is helped with his stellar cast, which includes; Brie Larson, Armie Hammer, Cillian Murphy, Sharlto Copley, Jack Reynor, Michael Smiley, Sam Riley, Noah Taylor, Enzo Cilenti and Babou Ceesay. Free Fire is simply a film about a shootout, the entirety of the film is that, people shooting at each other. It is an arms deal gone terribly wrong and fill a room with egos, vanity and greedy people I guess it only is going to end badly. And I guess that is what this movie is about greed, vanity, ego and that crime really does not pay in the end. The main deal is between IRA members Chris (Cillian Murphy) & Frank (Michael Smiley) and arms dealer Vernon (Sharlto Copley), with the whole thing being overseen and put in to order by Ord (Armie Hammer) and Justine (Brie Larson). From the beginning tensions are high and with a volatile encounter being the catalyst that initiates the bullet fraying madness. There are times in the film that it does start to move a little slow, which is strange considering that most of the film is set up with high levels of adrenaline pumping. The dark humour of this film is effortless, this is helped with the cast who all fit their roles perfectly and have fun with it. Brie Larson excels as Justine as she cuts away from the testosterone filled warehouse and plays a smarter game. For me the main star was Vernon (Sharlto Copley), I have always been a massive fan of Sharlto and his role in Free Fire does not change this, his mad portray of Vernon, he ability to be mad and funny at the same time is genius, I love him. 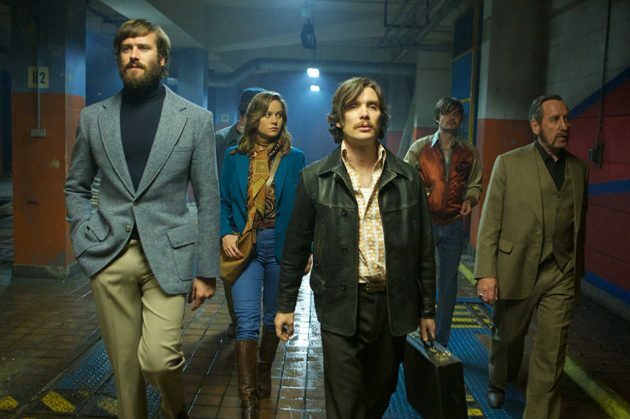 As already said Free Fire is arguably one of Wheatley's of his best offerings yet. This film is inventive, comedic, gruesome and thrilling. Can't wait for his next one.